Memoir has long been one of my favorite genres. The first memoir I read about alcoholism was Caroline Knapp’s DRINKING: A LOVE STORY in 1997, and so, excuse the awful pun, the bar was set quite high. 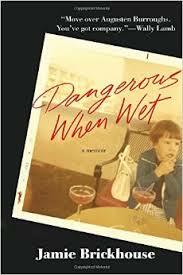 Jamie Brickhouse's DANGEROUS WHEN WET is absolutely amazing and staggering. He has a rare talent for fully confronting each part of his life with total honesty, sensitivity, cutting wit, and Falstaffian vigor. Mr. Brickhouse said he only was able to write this memoir after the death of his mother, “Mama Jean—my greatest champion and harshest critic.” The book is a brave and clever fusion. He writes about his Texas boyhood, his relationship with Mama Jean (and his father Earl), and his homosexuality and coming out, his discovery of alcohol, and, according to Mama Jean, his true destination was to become a writer. Mama Jean was right (she was about mostly everything), however Jamie’s journey involved a lot of rough road. He moved to New York City after college in the autumn of 1990, just after graduating from college in Texas. He developed his lifelong love of Manhattan mostly through 20th-century melodrama films and trips up to New York with Mama Jean and Earl. Like many writers, Jamie went into the commerce of books rather than the practice. He was a highly successful publicity executive at the top book publishers. He also was lucky in love, having met his boyfriend within six weeks of his arrival. However, he systematically destroyed his life because he could not control his drinking, or what he did during alcoholic blackouts. This is a deeply moving read. I was in tears over some passages, only to start giggling over Jamie Brickhouse’s brilliant humor. DANGEROUS WHEN WET is a memoir of recovery, but, man, it don’t come easy. I believe this will appeal to people in recovery, to gay men, and, frankly, everyone because we each need to deal with our relationships with our parents before we can truly say we have grown up. I for one cannot wait until Mr. Brickhouse writes a novel. Until then, I shall be preaching the gospel according to Jamie, and Mama Jean, for quite some time.